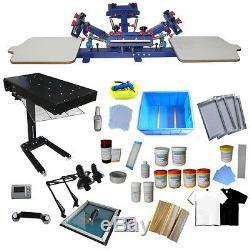 4 Color 2 Station Screen Printing Full Starter Kit. This kit is especially designed for new hand to learn and apply 4 colors T-shirt printing. 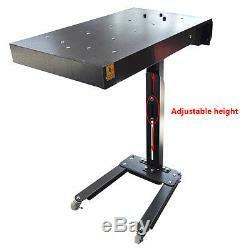 It includes all the equipments and materials for making screen printing plate & doing 4 colors T-shirt screen printing. With high quality at a reasonable price, easily set-up, register and print. With this kit, you can also start a fun and profitable business for printing shirts! This is the most complete screen printing starter kit. 4 Color 2 Station Screen Printing Machine (006523). Comparing with the original 4 color 2 station printer, this new type machine has a function of micro-adjust. If you want to do color matching, you can use those small red handles to move the screen frame right or left slightly. It will be a good choice for colorful printing. This equipment can be applied to clothing (especially for T-shirt), woven fabric, metal, paper, copybook, plastic, circuit board, wood, glass, ceramic tile, leather and other plane printing substrates, which is especially suitable for small businesses and individual printing shop. Foundation is consistent with heating box , stable, saving-space and overcoming the flaw caused by traditional. That easily gets knock and stuck. After well installed, connect the power supply and turn on the switch and then it will work automatically. With four universal wheels, easy move. Sturdy design with powder coated housing to prevent rust. With a few bolts you have a flash that's ready to be put to work. Crate Dimension: 34"x20"x14(86x51x36cm). Screen Printing Equipments & Materials Kit (006801). Washout Tank with Water Gun Included. Plate washing is one of the most important processes during screen printing. Premium plate-washing tank of our company is furnished with water tank, automatic pressurizing water spray gun and screen frame clapboard, which can make plate washing cleaner and more convenient. Internal dimension: 26"X20"X15 (66X50X37cm). Screen plate making is one of the most important procedures for doing screen printing business. 1 Photosensitive Emulsion & 1. 20 pcs transparency film & 100ml. Blacken printed graphics to guarantee a better exposing effect. 4 pcs 16"x20" Frame with 120 mesh count & 1. Printing & After-printed Screen Processing Kit. 500g Pallet Adhesive & 1 Pallet Adhesive Scraper. 6 bottles Plastisol Inks (black, white, green, red, yellow, blue). 4 sheets Clean Up Card. 2 pc T-shirts for printing test. 200g All Mesh Prep Degreaser. 1 1 set of 4 color 2 station screen press (006523) 2 1 set of Flash Dryer (006042) 3 1 set of screen printing equipments & materials kit (006801), which includes the following items. 1 set of Washout Tank (006008) 02. 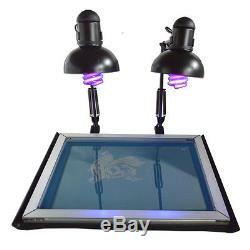 1 set of UV Exposure Unit Kit, with glass & sucker, rubber sub-plate included (006800) 03. 1 set of photosensitive emulsion (008401) 04. 1 pc of 14 Emulsion Scoop Coater (007001) 05. 20 sheets of A4 Transparency Film (007003) 06. 1 bottle of Graphics Blackening Agents (007006) 07. 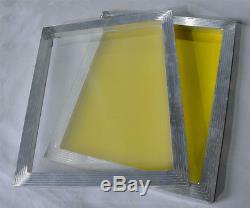 4 16"x20" Screen Frame with 120 Mesh Count (007266) 08. 1 roll of Aluminum Foil Tape (008433) 09. 1 bottle of Pallet Adhesive (008450) 10. 1 pc of Pallet Adhesive Scraper (009161) 11. 4 pcs of Spatulas 13. 4 sheets of Clean Up Card (009162) 14. 4 pcs of 13 Squeegees (007307) 15. 1 bottle of Emulsion Remover Powder (008417) 16. 1 bottle of Ghost Cream (008420) 17. 1 bottle of All Mesh Prep Degreaser (008512) 18. 2 pcs of T-shirts (001801). Orders are processed from Monday-Friday; Not on the weekends & public holidays. We will work with you to get the case resolved in the fastest method. Please contact with us at first for more details. If product was received damaged or not as described, please send us some pictures or videos, so we could well understand your problem, then solve them for you ASAP. The item "Screen Printing 4-2 Press Kit DIY Printer & Flash Dryer & INK DIY Squeegees" is in sale since Monday, January 28, 2013. This item is in the category "Business & Industrial\Printing & Graphic Arts\Screen & Specialty Printing\Screen Printing". The seller is "asc365usa" and is located in Rancho Cucamonga, California.